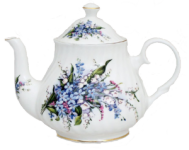 A wonderful selection of two, four, and six cup bone china teapots imported from England. Choose from Crown Trent, Amber, and Roy Kirkham's beautiful floral patterns as well as fun patterns featuring dogs, birds, cats, and butterflies. We also have various shapes of teapots like traditional, tulip, round, and swirled. Please note that all bone china orders are shipped UPS so must have a physical delivery address and not a PO box.